In a general context of rising state repression and bonapartization of political regimes in Europe, we interviewed the Serbian visual artist and anarchist Milica Ružičić. 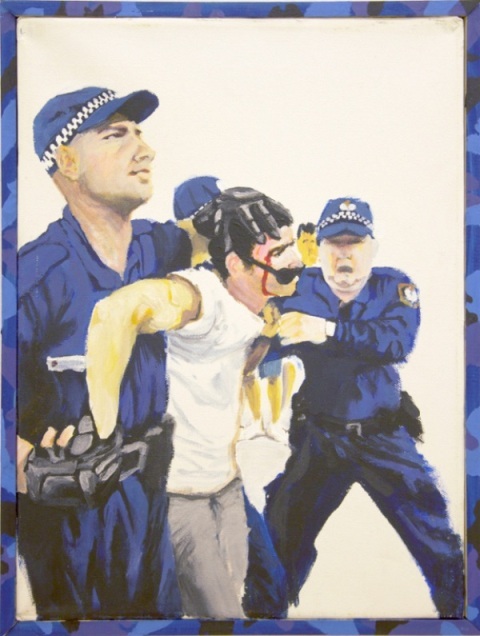 In 2010, she dedicated a serial of paintings to denounce police violence around the world. Currently, she also teaches at the College of Fine and Applied Arts and is a singer in Cruellas, a band based in Belgrade, Serbia. 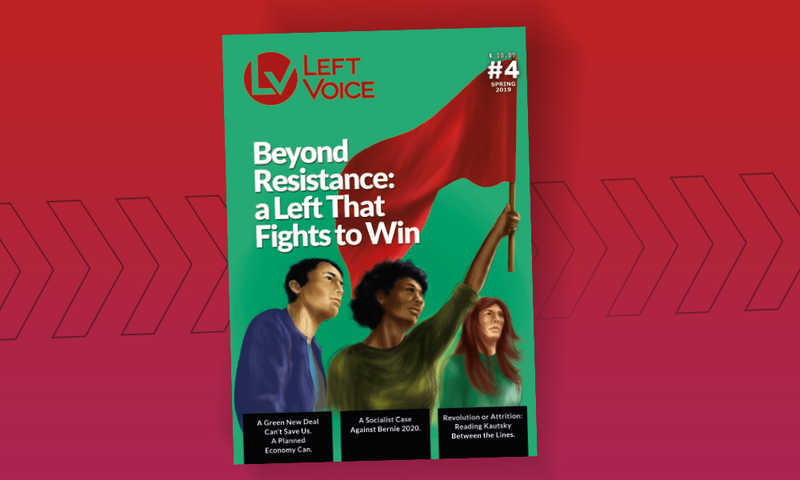 This is a translation of an interview originally published in Révolution Permanente. 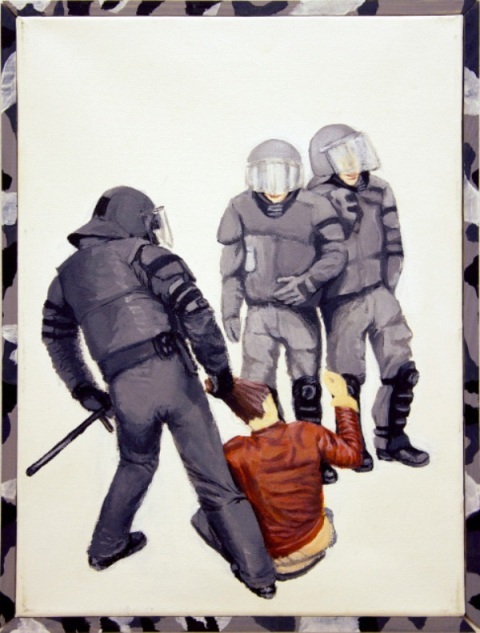 In 2010, you made a series of paintings depicting police brutality during demonstrations in different parts of the world. What did you want to express in these paintings? 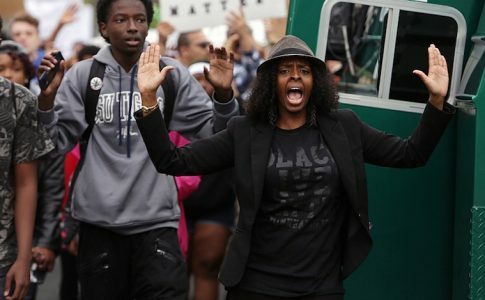 Why focus on police and state brutality? I was sick of seeing this kind of news coming from all around the world and how quickly we forget about it–and it keeps happening. It feels like all the states have declared civil wars on their own citizens. Police uniforms were getting as frightening as the military ones, and that became a worldwide rule since the 1999 [WTO demonstrations] in Seattle. Although police are paid with taxes paid by citizens, you rarely see them really protecting the citizens (except on numerous TV shows). Much more often, they are ordered to protect the interests of the few. It’s worse than the old quote, “I can hire one half of the working class to kill the other half,” because we are paying the half that is beating and killing us, not those who give their orders. With these paintings, I wanted to keep the pictures from the news alive longer. Canvas paintings hang on the walls and are viewed repeatedly, so they will have a longer life than images from the internet or newspapers. I wanted to give them more importance–as visual representation of that civil war context we are living in, where political opinions are suppressed by repressive means of power. 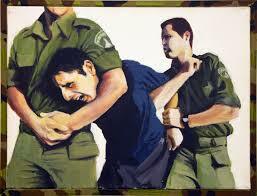 That is the reason why I painted people involved in conflict on a white canvas. It’s a way to take them out of the visual context (though the context is in the title of every painting), so those who see the exhibit can recognize the similarities. Paintings are framed into the hand painted frames that have camouflage colors, which are associated with the army and the borders of every country. Paintings were done on the canvases that are produced by the prisoners in a penal institution in Sombor, as working therapy. I thought it symbolically important, also, to speak in the name of the repressed on those kind of canvases. 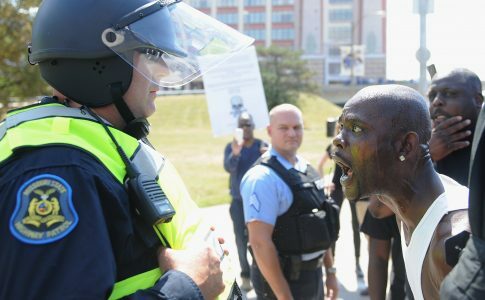 Today, this police brutality is the same, if not harsher. It’s not just demonstrators who face repression, but also and especially today, refugees in different countries throughout Europe: Macedonia, Serbia, Hungary, Croatia, Slovenia, Austria, Germany, France, UK, etc. 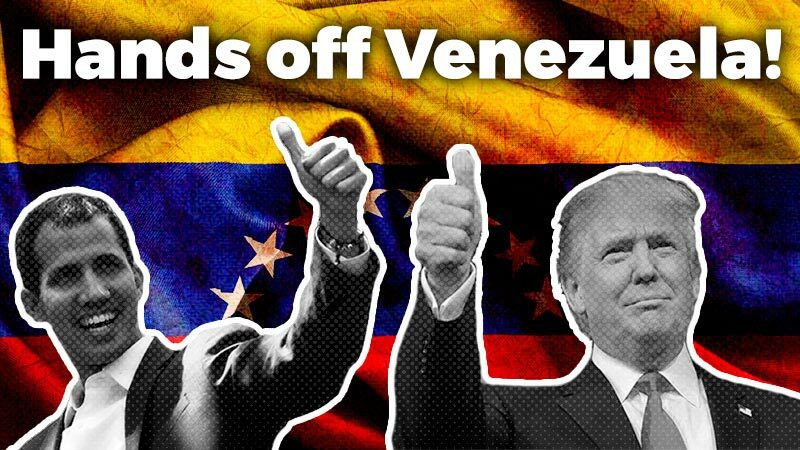 Not only do we have ongoing civil wars between the few in power and their own unarmed citizens, but also the fight for resources is making global politics look horrible. It’s the same old story of exploitation we had in the 19th century and before, just with new technology and weapons. After the fall of eastern socialist bloc, all the small and weak member-states of non-aligned movements became prey for big capital: that’s what we call neo-colonialism. The only difference is that the ways of exploitation of natural resources and people are far more efficient after a century of technological progress (I mean the 20th century here). Since then, capitalism is going much faster than before, a full-speed roller coaster on the edge of control. Capitalism never wanted to be controlled, but it seems it’s going to push us over the edge of the cliff before it crashes and gives the final proof that it is not sustainable, and it could never be. What we have here with the question of refugees is an old story of class segregation. These people are running from wars or poverty–there is not much difference. Their poverty is caused by neo-colonial economic pressures on the periphery; the wars are caused by the neo-colonial fight for resources. The difference is that colonialism can work for central states only if the poor stay poor in their own poor cities and villages, and their money and extra value go easily across the borders. I don’t know how anyone could think that people wouldn’t try to escape that context, when they are given no choice. But Europe seems surprised at these events, although it doesn’t see the solution or the obligation to solve its problems, to solve the current situation. So far what we see is repression, and it offends anyone with a brain to think this can be a permanent solution. Immigrants are seen there as an economic disaster and that’s why the terrorism stories give understandable cause to be restrictive and repressive to them, and also again to their own citizens (the same recipe brought the Patriot Act in the USA). But what is wrong here is the distribution of value, and those who don’t want change see everyone else as their enemy, no matter if they are immigrants or not. This story, no matter how old, will continue as long as we have this kind of system, based on profit and a free-market fairy tale. 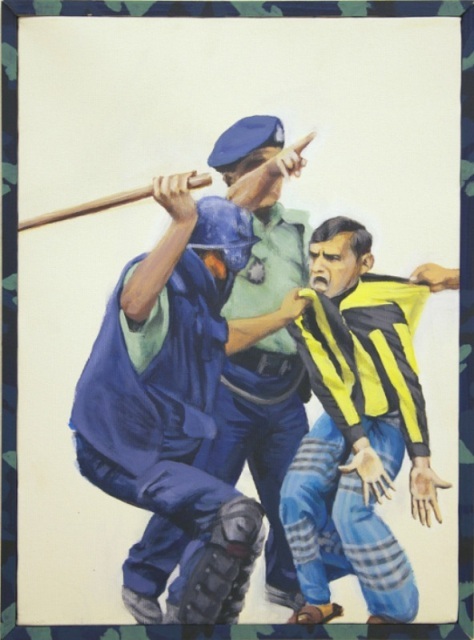 You haven’t only painted scenes of police brutality, but you’ve also made a painting of workers of Jugoremedija, a pharmaceutical factory that was under workers control. 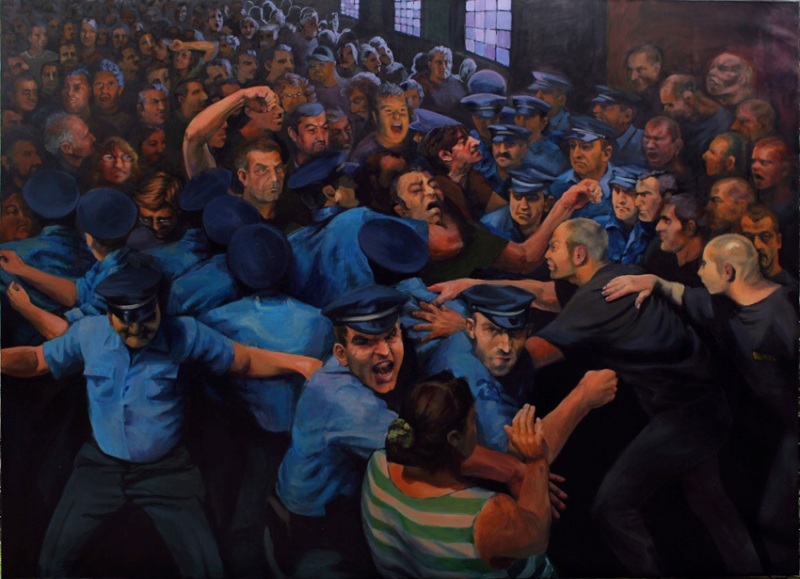 Why do you think it’s important to paint scenes of mass and workers’ struggles? For me, that painting represents a positive example of collective struggle for the right to work. That’s why I gave it those huge museum dimensions (2×3 m). My intention was to make it in a form of important historical event, since this story was very manipulated in the media. The workers of that factory didn’t give up easily to the transition of ownership, which is still going on. They were protecting the factory that they built against irresponsible, private, so-called investors whose only interest was to take easy money and not keep the jobs or factory running. In one moment for 2 years, workers managed to win the battle in court, take over control and keep the factory working. They even made huge progress in just a short period of time, but sadly, political pressure from different influential state positions, gave results in the end. They were pushed to bankruptcy with a bad valuation assessment, just to give another private investor a chance to make easy money. So even that long and persistent struggle (it lasted around 10 years in total) was finished in the end, and the workers lost once again, some time after I finished the painting. That is a story that’s supposed to give some hope and remind us of what we shouldn’t forget, all so many struggles people had to go throughout the history to get some basic rights we are losing again these years. 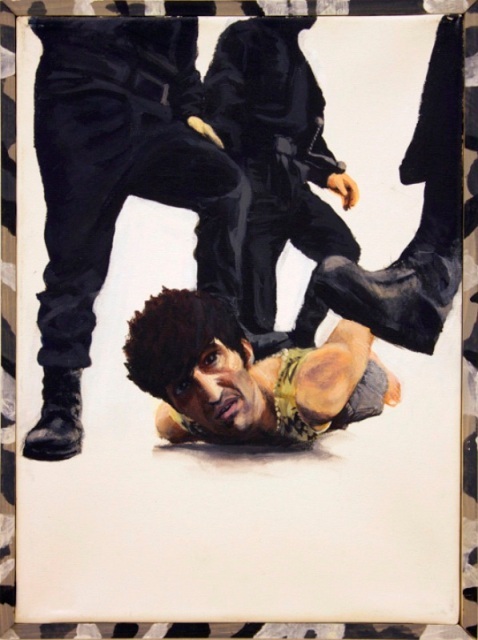 I would hope that these paintings could help the public realize the current political and economic situation and maybe encourage more of those cases of collective uprisings from the bottom. Uniting all the exploited and unemployed, different from one another except for their class identity, not with the aim to lose the other identities, but to gain the bigger battle, a turnover of the system, which could bring a different context in which different identities could live dignified. 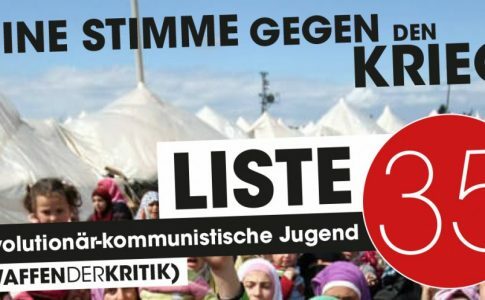 Student elections at the Free University of Berlin: Raise your voice against war!